The wealth of website builders means you've got a great selection of tools to choose from, but it can be difficult to pick out the best from a crowd of so many. To help you narrow down your choice, we've picked five website makers that are particularly well-suited to portfolio work and offer a good balance of price points and features. All of these site builders offer simple ways of customizing your pages once they're online, so you can regularly change the look of your work, and make sure your talents are always being well promoted on the web. 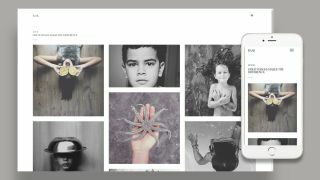 Another great option for building a smart portfolio website is Wix. It’s dead easy to use, taking all the pain out of site creation, while still offering plenty of power under the bonnet. Weebly was first set up with the intention of making it easy to set up a portfolio of work online, and those origins stand it in good stead today, even as it has broadened its horizons to become more of a general website builder. If you don't mind a Weebly subdomain, some ads on your site, and a limit of 500MB storage, you can actually use it for free. While the choice of themes is relatively small, they're all fully customizable, and they all work on any size of screen, automatically reformatting to suit the display dimensions. Weebly has one of the most elegant and user-friendly website editor interfaces we've seen, so you can tweak your portfolio in exactly the way you want. If you want to get up and running quickly, would like to spend some – but not a lot – of time customizing your site, and need something that's going to be reliable and comprehensive, Weebly fits the bill. The fact that you can get started for free to see if you like it is an added bonus. There's a lot that appeals to us about the website builder Cargo: the unconventional and varied choice of templates, the intuitive page tweaking interface you can edit them with, and the way that you can build up an entire site without paying a penny (you won't be charged until the site goes live). It's certainly got more of an edge than other comparable website builders, which might be good or bad depending on what you're looking for. The templates available are all eye-catching and bold, and will work best for people wanting to stand out from the crowd, whether that's with photography or writing. Built on the latest HTML5 technology and with useful extras like e-commerce and domain name support included, IM Creator is going to be too advanced and in-depth for some, but will suit other portfolio builders perfectly. That's not to say it's difficult to use – there's just more going on. You don't need to know a shred of code to get started, there are plenty of different themes and looks to choose from, and we like the way the themes are already pre-populated with content. That means you can just edit the sample material that's already there rather than starting from scratch, which can be more daunting. We'd recommend IM Creator if you're looking to stand out from the pack – it has a wide choice of templates and some detailed editing options too. On the other hand, it does need a bit more of a time and effort investment than other site builders. Krop is a creative jobs site and a portfolio builder rolled into one, so you know that its services are trusted by people in the same industry as you (or the same industry that you're trying to break into). What's more, its template options are some of the most well-designed that we've seen. Considering Adobe makes some of the best creative software in the business, you would hope it knows what it's doing in terms of displaying portfolios on the web – and we're glad to report that is indeed the case. This is slightly different to the other services we've mentioned here, because it's a free add-on to the Creative Cloud suite developed by Adobe. If you don't already pay for the programs then Portfolio is unlikely to tempt you to part with your cash, but if you are a CC subscriber, it's worth looking at this before venturing anywhere else. While it doesn't offer as many customization and layout options as some of the other site builders we've mentioned here, Adobe Portfolio does make the process of getting your work online simple and fun. Of course there's also the tight integration with Adobe's apps, so you can easily share your work straight from Lightroom to the web. You can also purchase and connect a domain if you wish. Pages are optimized for any device and certain ones can be password-protected if needed, and there's also the option to bring over a domain name you already own. For a simple portfolio maker that plugs right into the apps you already use (assuming that's the case), it's ideal.